To understand what drives economy and society today, we need to look beyond those “pretty, polite techniques which try to deal with the present by abstracting from the fact that we know very little about the future”. In doing so, we can learn from the efforts of some giants of an earlier era. John Maynard Keynes, magnum opus, The General Theory, was his effort to understand the drivers of the Great Depression. It is a difficult book, and rarely read today. “We have as a rule only the vaguest idea of any but the most direct consequences of our acts. Of all human activities which are affected by this remoter pre-occupation it happens that one of the most important is economic in character, namely, Wealth. The whole object of the accumulation of Wealth is to produce results, or potential results, at a [distant] date. Thus the fact that our knowledge of the future is fluctuating vague and uncertain, renders Wealth a peculiarly unsuitable subject for the methods of the classical economic theory. The world over, political and economic agendas that fail to offer hope to the “middle” of society have turned out to be recipes for downward spirals of ethno-populism. More than other middle-income countries, South Africa’s citizens remain either affluent or poor, with little in-between. As of 2015, only a quarter of the country’s citizens enjoyed a level of living that could be described as stably “middle class” or better. Half of the population remained chronically poor, dependent on safety nets for survival. And the quarter in-between – who, in a thriving society, would be carriers of hope from the middle to the bottom of society – struggle, mostly in vain, to stay out of reach of destitution. My recent piece, syndicated in The Conversation as per this link, explored how this can be turned around. See below for the pre-publication version, which includes somewhat more detail on the three suggested ‘guideposts’ for turnaround. South Africa’s election season is underway, but the discourse is stuck in a time warp. We need to look beyond the familiar nostrums that have held sway for much of South Africa’s first two decades of democracy. In his February, 2019 State of the Nation speech, President Ramaphosa followed the classic fix-the-business-environment formula for job creation, setting a target to move South Africa’s performance up from 82nd to the top 50 in the World Bank’s ease of Doing Business ratings within the next three years. The rhetoric from the opposition Democratic Alliance is similar. The populist Economic Freedom Front’s vision for jobs seems to be to emulate Venezuela. Indeed, South Africa urgently needs to get its economy moving again. But as two great twentieth century economists John Maynard Keynes and Albert Hirschman teach us, economic momentum is not created by focusing on the myriad pinpricks about which business continually complains. Rather, the way to reinvigorate the economy is to rekindle hope across society. “Two principal tasks or functions must be accomplished. The first is the unbalancing, entrepreneurial function…… Increasing social and income inequalities are an important part of this picture…..In time, pressures will arise to correct some of these imbalances…..This is the ‘equlibrating’ distributive, or reform function….”. South Africa’s GEAR (Growth, Employment and Redistribution) strategy, adopted in 1996, marked the start of an entrepreneurial phase. Growth reached an average rate of over five percent per annum between 2004 and 2008, better than for any period since the 1960s. Even so, as a recent study documented, as of 2015 only a quarter of the country’s citizens enjoyed a level of living that could be described as stably ‘middle class’ or better. Half of the population remained chronically poor, dependent on safety nets for survival. And the quarter in-between (who, in a thriving society, would be carriers of hope from the middle to the bottom of society) struggle, mostly in vain, to stay out of reach of destitution. More than other middle-income countries, South Africa’s citizens remain either affluent or poor, with little in-between. Against that backdrop, it hardly is surprising that by the early 2010s South Africa saw the emergence of a vituperative political discourse characterized by assaults on “white monopoly capital” on the one hand and a preoccupation with institutional decay and state capture on the other. “… is like a credit that falls due at a certain date. It is extended in the expectation that eventually the disparities will narrow again. But if the expectation…. does not occur, there is bound to be trouble and, perhaps, disaster…… Nonrealization of the expectation that my turn will soon come will at some point result in my ‘becoming furious’ that is, in my turning into an enemy of the established order…No particular outward event sets off this dramatic turnaround… Rulers are not necessarily given any advance notice about [the tunnel effect’s] decay and exhaustion…”. “While the performance of the entrepreneurial and reform functions (in some proper sequence) may be ‘objectively’ essential for the growth process, their protagonists are more often than not determined adversaries….. When reformers enter the stage they may well be full of invective against the entrepreneurial groups, who will return the compliment….”. What might a turnaround look like in South Africa’s current conjuncture? Here are three guideposts. Don’t confuse a re-embrace of the ‘entrepreneurial function’ with reform. In early 2018, with the recall by the ANC of President Jacob Zuma and the accession to the presidency of Cyril Ramaphosa, South Africa seemingly reversed course. Notwithstanding continuing infighting within the ANC, the country has witnessed an ongoing removal from positions of authority within government of many who had been deeply complicit in state capture and associated institutional decay. But institutional turnaround is not enough. Give priority to responding pro-actively to the concerns of the quarter or so of the population stranded in South Africa’s twilight zone between middle class stability and abject poverty. Do what it takes to strengthen ladders of upward mobility. To citizens stranded in the disappointed middle, election season sounds like just another replay of empty promises. Jobs? Better institutions? They’ve heard it all before. A genuine, visible – and, crucially, well-financed — commitment from across society to invest in ladders of opportunity and inclusion would offer a tangible basis for hope, especially for young people. As I’ve explored here and here, the weaknesses in South Africa’s ladders of opportunity are different – and the challenges more readily addressable – than those usually emphasized in South Africa’s blame-centric political culture. Visible gains in the affordability and efficacy of ladders of opportunity and inclusion have the potential to unlock the most crucial ingredient of all – a renewed sense of agency among South Africa’s citizens, of hope that, working together, we indeed have it in our power to build a future with a real prospect of a better life for all. That growth is an ‘unbalanced’ process, characterized by leads and lags – staying on track calls for ongoing shifts in policy priorities. That post-crisis renewal of a cycle of inclusive growth is likely to come (if it does), not from a pre-occupation with narrowly pro-growth policies but from a revitalization of hope among those who had been left behind by the earlier, unbalanced process. In time, pressures will arise to correct some of these imbalances, to improve the welfare and position of groups that have been neglected or squeezed, and at redistribution of wealth and income in general. This is the ‘equlibrating’ distributive, or reform function….”. “No particular outward event sets off this dramatic turnaround… Rulers are not necessarily given any advance notice about [the tunnel effect’s] decay and exhaustion…. On the contrary, they are lulled into complacency by the easy early stage when everybody seems to be enjoying the very process that will later be vehemently denounced and damned as one consisting essentially in ‘the rich becoming richer’ ”. The parallels to our times are obvious. 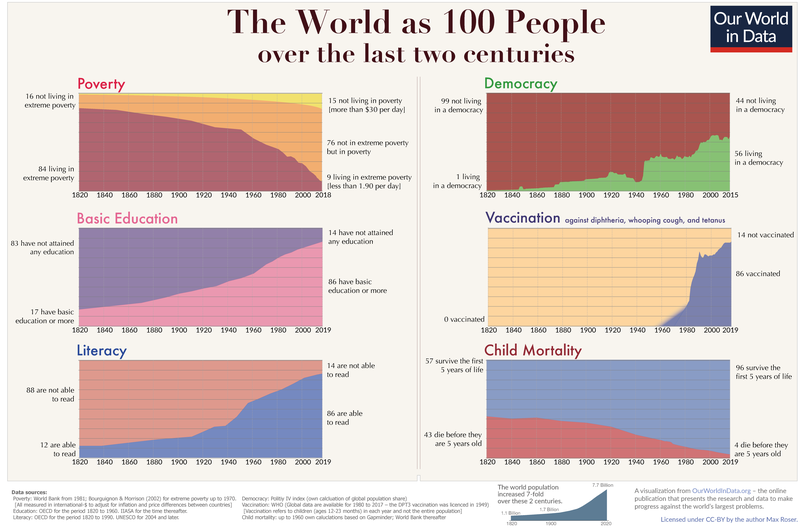 Since the 1950s, repeated waves of accelerating globalization and technological change have brought massive worldwide gains in human wellbeing (see here and here). But now, unexpectedly, we find ourselves in a time of reaction – with backlashes in country after country from those who perceive themselves as losers, or made vulnerable, by accelerating change. The rise of ethno-nationalism in the United States and Europe comprise obvious examples. A parallel process is evident across a range of middle-income countries, as well. This is in part because new waves of change threaten beneficiaries of earlier waves – and, in part because, as per the ‘tunnel effect’ (and as illustrated by countries as varied as Brazil, the Philippines and South Africa) only a small proportion of society turned out to benefit from the new opportunities for upward mobility (with the process all-too-often short-circuited by corruption, state capture and power asymmetries which favored the more-established elites). This brings us to the third set of ‘Hirschmanian’ ideas – how countries which seemingly have been engulfed by reaction can renew their growth cycles. Hirschman’s insights are especially counter-intuitive vis-a-vis the neoliberal discourse of the past four decades – a discourse pre-occupied with market-oriented, private-sector-led visions of development, propelled forward by improvements in the business environment (as measured by one or another variant of Doing Business indicator). Hirschman suggests that once a crucial threshold has been crossed, development and growth are not renewed by doubling-down on the entrepreneurial function, but by an embrace of reform. “The appearance of the reform function on the stage at the right time and with the right strength is not in any reliable fashion co-ordinated with the entrepreneurial function and its performance. In fact while the performance of both functions (in some proper sequence) may be ‘objectively’ essential for the growth process, their protagonists are more often than not determined adversaries….. When reformers enter the stage they may well be full of invective against the entrepreneurial groups, who will return the compliment….”. Yet, paradoxically, as the Hirschman cycle suggests, renewed growth comes from successfully carrying out the redistributive, reform function. The suggestion that the seemingly dark times of Latin America in the 1970s carried within themselves seeds of renewal was typical of Hirschman. Indeed, in its 2012 remembrance, the New York Times described Albert Hirschman as “the optimistic economist”. Hirschman himself described the “fundamental bent” of his writing as being “to set the stage for conceptions of change to which the inventiveness of history and a ‘passion for the possible’ are admitted as vital actors” – a sensibility which was informed, as he put it, by “a bias for hope”. But there is another way to interpret Hirschman, also rooted in an historical parallel, this time the 1930s. In the fall of 1932 he entered the University of Berlin as a first year student. By early 1933 Hitler and the Nazi Party had come to power, and Hirschman, of Jewish background and with left-wing political sympathies, had gone into exile. In the early 1940s, he helped smuggle many of Europe’s leading artists and intellectuals across the Pyrenees into Portugal, from where they could make their way to the United States. Hirschman’s optimism was the willed optimism of a search for silver linings – an optimism which knows that, in times of light, the potential for darkness looms – but also that, during times of darkness, seeds of renewal can germinate. So, too, in our times. A renewal of hope is possible – but there are no guarantees. Deepening darkness also looms as a possibility. Improving learning – how do governance systems matter? New measurements confirm that governance systems matter for learning outcomes. But knowing, in a statistically robust way that systems matter is one thing. Understanding how they matter, and what are implications for action, is another. A useful blog by Marla Spivack of the Center for Global Development and the global RISE (Research on Improving Systems of Education) programme reviews the new econometric measures – which were used by Gabrielle Wills, Debra Shepherd and Janeli Kotze to assess the impact of governance systems on learning outcomes in chapter 6 of the recent book, The Politics and Governance of Basic Education: A tale of two South African provinces (Oxford U Press, 2018). A broader goal of the 2018 book (with which I was centrally involved) was to anchor specific empirical findings within a comprehensive, multilevel (national, provincial and school) analysis of how politics, institutions and governance interact. Move beyond a narrowly technocratic pre-occupation with education ‘production functions’ – with exploring in a narrowly economistic way how specific inputs influence learning outcomes. Here’s how Spivack describes the limitations of the ‘production function’ approach: “There are numerous component parts of an education system that can either promote or impinge on student outcomes…. RISE calls these the ‘proximate determinants’ of education outcomes. Vast academic and policy literatures exist examining the proximate determinants of learning…. Questions like ‘what is the effect of teacher training on learning?’ what is the effect of missing textbooks on learning?’ and ‘what is the effect of a new pedagogical approach on learning?’ all follow this formula…… Their effects on children’s outcomes differ across contexts. RISE is interested in understanding the features of systems that mediates these varied effects”. To put it differently, it is not so much the ‘independent’ magnitude of the effects on learning of proximate determinants, but how they interact with governance systems that is key for understanding their effects on learning outcomes. Governance influences learning outcomes via three distinct channels: the technical efficiency with which inputs are deployed; whether inputs are used for their intended purpose; and the evocation of agency – the commitment and motivation of those involved in the education endeavor. Having embraced governance as crucial, those with a technocratic bias may be inclined to fall into the technocratic trap of focusing only on the first and second channels – with an implied presumption that better top-down, process-compliant hierarchical systems are sufficient to improve educational outcomes. But, as per the above, governance functions are multi-dimensional – and include the ‘agency’ channel (on which more below). As the book explored in depth (see HERE), different locales vary in the strengths and weaknesses of each of these governance dimensions. These divergent patterns explain why, as Spivack’s blog summarizes, “the Western Cape effect is not always positive – the WC’s education system is stronger than Botswana, Gauteng and the Eastern Cape, and weaker than Mauritius and Nairobi and the Central Region of Kenya”. Context matters – politically and institutionally-driven incentives and constraints shape what governance entry points for improving learning outcomes are feasible in specific settings. A central feature of the 2018 book was a systematic juxtaposition of hierarchical and horizontal approaches to education sector governance. The intent was less to explore whether one is ‘better’ than the other, but to enrich the menu of options for improving learning outcomes. As chapter 7 of the book detailed (and as I summarized HERE) variations in the performance of the Western and Eastern Cape education bureaucracies are rooted in profound differences in the socio-economic, political and institutional context of the two provinces. Given these structural constraints it would be misguided to focus narrowly on “fixing the bureaucracy” as a way to improve learning outcomes in the Eastern Cape province. A broader range of options (including an investment in strengthening learning-oriented parental and community participation) might usefully also be considered as part of the ‘governance improvement’ mix. So (speaking as much to myself and my current enthusiasm for the ‘evocation of agency’ as to others reading this piece), let’s avoid the lure of easy answers. As per RISE’s mission, taking governance seriously is an important step forward in efforts to improve learning outcomes. But there is much to be learned about how governance matters – with bold, persistent, learning-oriented experimentation at least as important as a further round of studies. When I wrote Working with the Grain (WWG) in the early 2010s, my intent was to provide a road map for pragmatism. At the time, it was plausible to think that, haltingly and unevenly, the arc of the moral universe was bending towards justice. But five years later there’s no avoiding the rise of polarization, ethno-nationalism and authoritarianism. In such a time, a call to engage pragmatically with power might seem hollow – or worse. What, then, is to be done? As illustrated by the figure below (taken from WWG), in working to address some specific reform challenge there is a spectrum of options. At one end are narrowly incremental options, aligned with the existing space for reform; at the other end is the option of engaging with stakeholders to expand the space for reform. At every level of decision-making, reformers (in government, civil society, or the donor community) must clarify how to position their engagement along this spectrum. While during periods of political stability, room for maneuver generally is likely to be limited vis-à-vis reforms of a country’s core governance arrangements, at more micro-levels the scope to be pro-active in working to ease constraints potentially is larger along both trajectories. Guidepost #4: Context – time as well as place — shapes whether or not a ‘with the grain’ approach is a useful way forward. This brings me to the ‘what’ of reform. At critical junctures, when foundational political and institutional challenges are in play, there are obvious limitations to with-the-grain incrementalism. But even at these junctures, the spirit of WWG has a distinctive implication (one to which I remain strongly committed) – it redirects attention away from polarized debates about fanciful ends towards pragmatic exploration of what Albert Hirschman termed ‘a passion for the possible’. This is especially relevant for efforts to transform governance. Guidepost #5: Avoid fanciful counterfactuals of what is possible -the evolution of ‘foundational’ institutions from personalized to impersonal is a slow, cumulative process. Crusades can over-reach – and anti-corruption crusades are no exception. The news offers an ongoing flow of whiplash-inducing examples. Here are two: the news of the near-landslide plurality (just short of an absolute majority) of votes won in Brazil’s presidential election by right-wing, anti-constitutional populist Jair Bolsonaro (with his campaign fueled, in part, by backlash in the wake of the country’s massive ‘car wash’ corruption scandal); and the news from South Africa of the resignation of the country’s widely respected finance minister, Nhlanhla Nene, who stood up bravely against former president Jacob Zuma when it really mattered (refusing, for example, to sign onto a likely ruinous nuclear power deal negotiated by Zuma with his friend Vladimir Putin) – but who it turned out had also cosied up some with the notorious Gupta family. How can we navigate this fraught terrain? 3: Wield a scalpel, not an axe. There’s no shortage of corruption in Indonesia – yet, paradoxically (as I summarized in this piece), the country’s anti-corruption agency, the KPK, has a remarkable track-record of taking on powerful players. A key source of its strength is its focus. It functions as a ‘tripwire’ against impunity. The number of cases it takes on each year are few, and carefully chosen. It discomfits the powerful. It enjoys widespread support across the country – indeed civil society support has been key to its resilience. 5: Avoid sanctimonious ‘maximalism’ . This, as I explored in a piece on aid agencies and anti-corruption linked here, is the trap in which many aid agencies found themselves. For organizations such as the World Bank to have ‘zero tolerance’ against corruption by their staff is necessary. To turn this into a crusade against all corruption everywhere is to take on the impossible – and in the process to debase the meaning of words. The experience of the WCED is thus something of a cautionary tale. Sustained efforts over many years have made for a well-functioning bureaucracy . But this turns out to be insufficient to bring sustained improvement in learning outcomes. Graph prepared by Luis Crouch for Chapter 2, “The transformation of South Africa’s System of Basic Education” in Brian Levy, Robert Cameron, Ursula Hoadley and Vinothan Naidoo (eds.) The Politics and Governance of Basic Education: A Tale of Two South African Provinces (Oxford: Oxford University Press, 2018) – available, by agreement with OUP’s open access policy, for free download via this link. Bureaucracies make convenient scapegoats when they get things wrong. But it turns out that they also can disappoint even when they do well those things which they are well-suited to do. The difference between having a well-oiled machine and achieving a sought-for development outcome emerges especially vividly through a comparison of South Africa’s Western Cape Education Department (the WCED) and Kenya’s educational system. Kenya generally outperformed the Western Cape. In 2007 assessments of Grade 6 mathematics capabilities conducted by the Southern African Consortium for Monitoring Education Quality (SACMEQ). The Western Cape’s median score was 560 points (well above the South African median of 483 points); the score for the poorer 25th percentile was 496 points. Kenya’s median score nationwide was 557 points, with a score of 509 points at the 25th percentile. For Kenya’s Nairobi district (the best direct comparator with the Western Cape), the median score was 585, and the score at the 25th percentile 535 points. Kenya achieved these superior results notwithstanding higher levels of poverty, average per pupil expenditures which were one fifth of South Africa’s, a cadre of teachers who were no better trained, and (when compared with the Western Cape) a relatively messy bureaucracy. Indeed, as the graph linked here (from chapter 2 in the book) shows, once socio-economic influences on educational outcomes are taken into account, as of 2007 Kenya stood out as far and away the most over-achieving of the countries participating in SACMEQ. Governance differences help account for these divergent learning outcomes. The WCED is a classic example of a bureaucracy pre-occupied with top-down management and process compliance. Kenya, by contrast, has numerous bureaucratic shortcomings – but (at least through to 2007) these were more than offset by an approach to education sector governance which gave priority, over many decades, to the evocation of agency. The WCED undertakes efficiently and effectively many important tasks expected of public education systems, including managing financial re sources, providing decent school infrastructure, assuring timely availability of textbooks and other inputs, assigning personnel to where they are needed, and tracking performance. (Chapter 4 of the book provides details.) Each of these are activities where the production process is standardized, and monitorability of processes, outputs and outcomes is straightforward – precisely the types of tasks which, for reasons explored here and here, bureaucracies are well-positioned to do well. Of course, the obverse can also apply: there exists a class of activities where production is more heterogenous and monitorability is more difficult – and thus which inherently are more challenging for public bureaucracies. In the best of all possible worlds, a public education system would be able to do all things well. The 2018 World Development Report, Learning to Realize Education’s Promise, highlights Finland and Shanghai, China as good examples. However, as the WDR explores in depth, these examples are rarities. Far more common are education systems which are coherent around narrow conceptions of process compliance (or incoherent, or coherent in the provision of patronage)– but which are not well-aligned with those school-based tasks for which much more responsiveness to hyper-level context is called for. A motivational channel — with school-level flexibility providing an opportunity for internal leaders to motivate teams effectively, and nurture an environment of continuing learning on the part of staff as well as students. The limits of narrowly top-down approaches to improving learning outcomes become evident in the school-level case studies in chapters 8 and 9 of the book. Take, for example, two schools in the Western Cape which initially were good performers. In both, top-down leadership by the principal was key to success, with consistent support from the WCED helpful in buttressing these principals’ authority. However, notwithstanding a formal governance framework which assigned significant authority to school governing bodies (SGBs) in which parents were the majority, both principals left little scope for participation by SGBs or by the broader community; school-level decision processes were hollowed out. In both schools, when it came time for the successful principal to retire and a successor to be chosen, the seemingly formidable strengths of the WCED’s bureaucratic hierarchy ended up being trumped by machinations involving low-level bureaucrats, senior school-level staff, and parents more interested in capturing control of resources than improving educational outcomes. Indeed, in both schools, within a few years after the departure of the ‘successful’ principal, performance collapsed. The roots of active civic engagement in the education sector run deep in the foundational ideas which shaped modern Kenya: in a decades-long effort to resist the British colonial influence; in the vision of the country’s liberation struggle leader and first president, Jomo Kenyatta, of an educated population as a central manifestation what it means to be a proud independent nation; in the inclusion of education as top priority in the country’s first national plan; and in an abiding commitment in the first decade of the country’s independence to Harambee – “self-help” – as the pathway to development. It is perhaps necessary to state the obvious: I am not arguing that having a well-managed education bureaucracy is a bad thing. As the comparison of the Western and Eastern Cape in the companion piece shows, learning outcomes are better when a bureaucracy functions well than when it functions badly. But the Kenyan experience points to a further dimension – the role of the ‘evocation of agency’, of a sense among multiple stakeholders at all levels (including teachers, parents, communities, public officials) that their actions can make a difference. In his February 2018 state of the nation speech, delivered within weeks of becoming South Africa’s President, drawing on the spirit of the NDP, and of a classic song by the late, great South African jazz trumpeter, Hugh Masakela, issued a call for Thuma Mina (“send me”). Indeed, perhaps in many countries struggling with a loss of trust, active citizenship can be an important antidote to the political distemper of our times – not only in education but across a wide range of arenas for public and civic action.